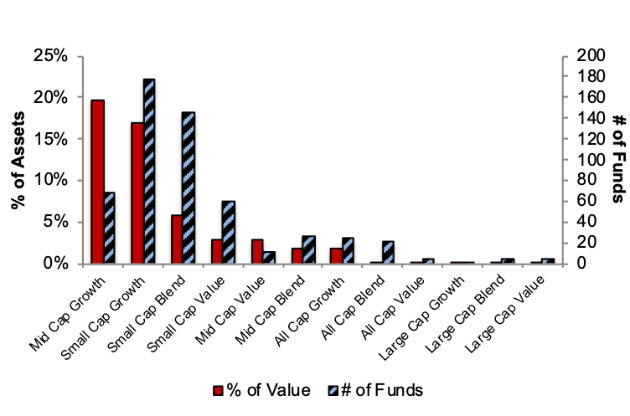 At the beginning of the first quarter of 2019, only the Large Cap Blend, All Cap Blend, and Large Cap Value styles earn Attractive-or-better ratings. Our style ratings are based on the normalized aggregation of our fund ratings for every ETF and mutual fund in each style. Our fund ratings are based on aggregations of the ratings of the stocks they hold. See last quarter’s Style Ratings here. 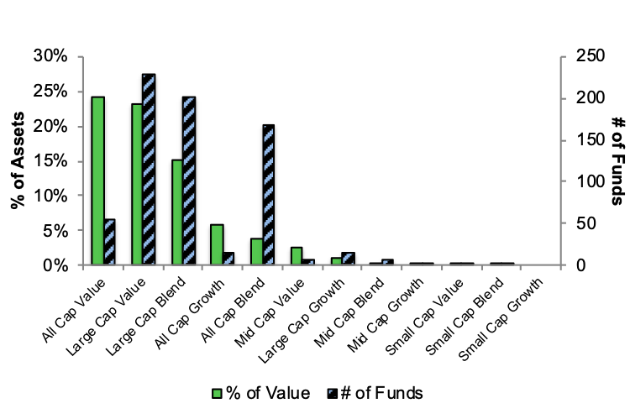 The Large Cap Blend and Large Cap Value styles house the most Attractive-or-better rated funds. Figures 4 through 7 provide more details. The primary driver behind an Attractive fund rating is good portfolio management, or good stock picking, with low total annual costs. Our Robo-Analyst technology empowers our unique ETF and mutual fund rating methodology, which leverages our rigorous analysis of each fund’s holdings. See Figures 4 through 13 for a detailed breakdown of ratings distributions by investment style. See our ETF & mutual fund screener for rankings, ratings and reports on 6800+ mutual funds and 400+ ETFs. Our fund rating methodology is detailed here. 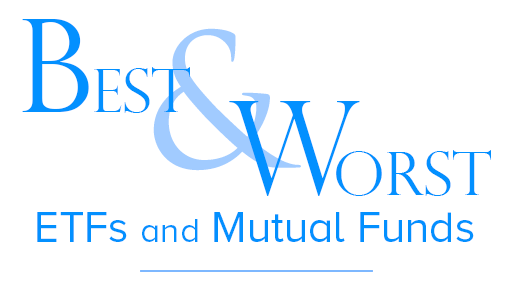 All of our reports on the best & worst ETFs and mutual funds in every investment style are available here. To earn an Attractive-or-better Predictive Rating, an ETF or mutual fund must have high-quality holdings and low costs. Only the top 30% of all ETFs and mutual funds earn our Attractive or better rating. State Street SPDR Dow Jones Industrial Average ETF (DIA) is the top rated Large Cap Blend fund. It gets our Very Attractive rating by allocating over 37% of its value to Attractive-or-better-rated stocks. MFS New Discovery Fund (MNDAX) is the worst rated Small Cap Growth fund. It gets our Very Unattractive rating by allocating over 45% of its value to Unattractive-or-worse-rated stocks. Making matters worse, it charges investors total annual costs of 4.04%. Figure 2 shows the distribution of our Predictive Ratings for all investment style ETFs and mutual funds. Figure 3 offers additional details on the quality of the investment style funds. Note that the average total annual cost of Very Unattractive funds is over three times that of Very Attractive funds. 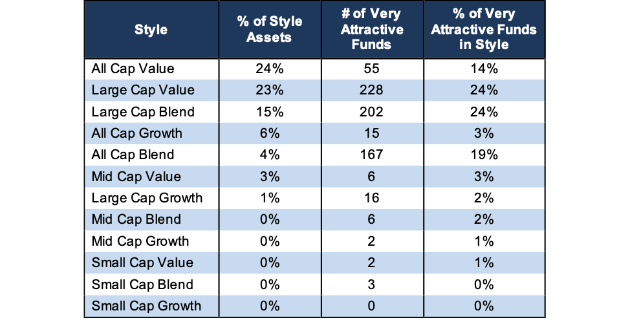 Figure 4 presents a mapping of Very Attractive funds by investment style. The chart shows the number of Very Attractive funds in each style and the percentage of assets allocated to Very Attractive-rated funds. 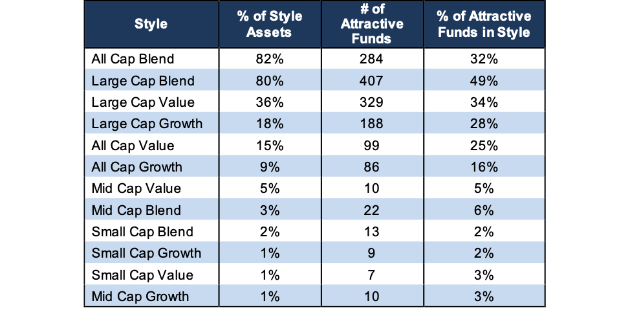 Figure 6 presents a mapping of Attractive funds by investment style. 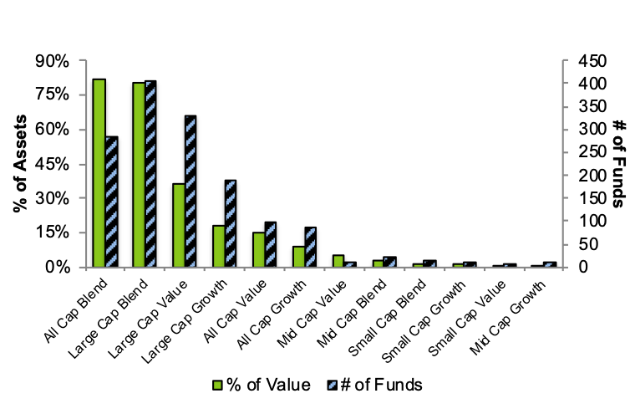 The chart shows the number of Attractive funds in each style and the percentage of assets allocated to Attractive-rated funds. 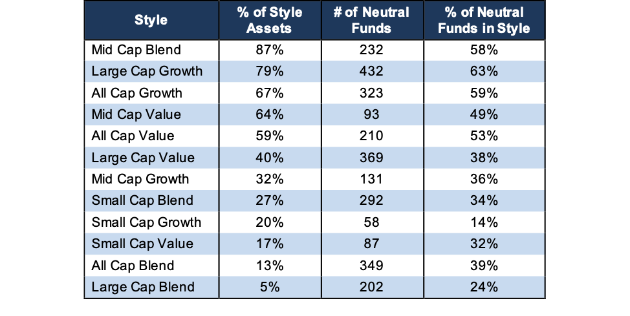 Figure 8 presents a mapping of Neutral funds by investment style. The chart shows the number of Neutral funds in each style and the percentage of assets allocated to Neutral-rated funds. Figure 10 presents a mapping of Unattractive funds by investment style. 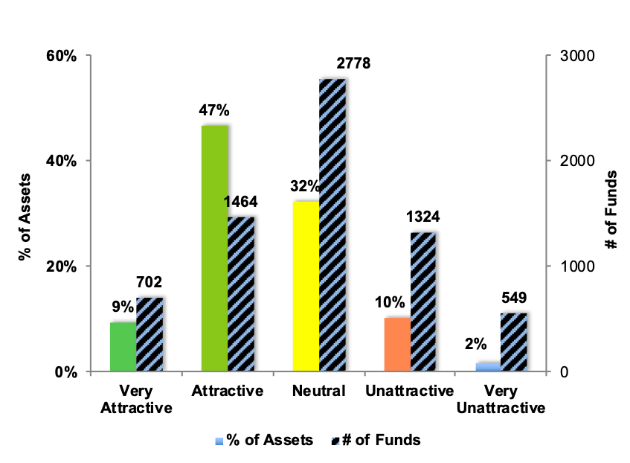 The chart shows the number of Unattractive funds in each style and the percentage of assets allocated to Unattractive-rated funds. 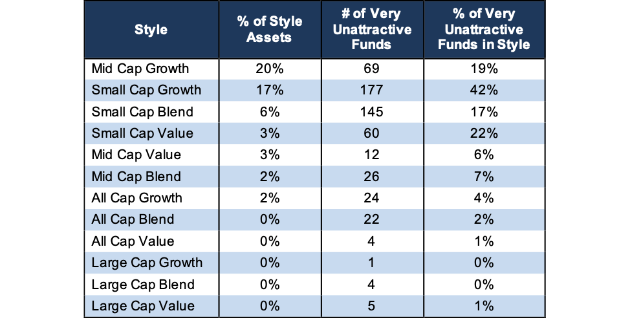 The landscape of style ETFs and mutual funds is littered with Unattractive funds. 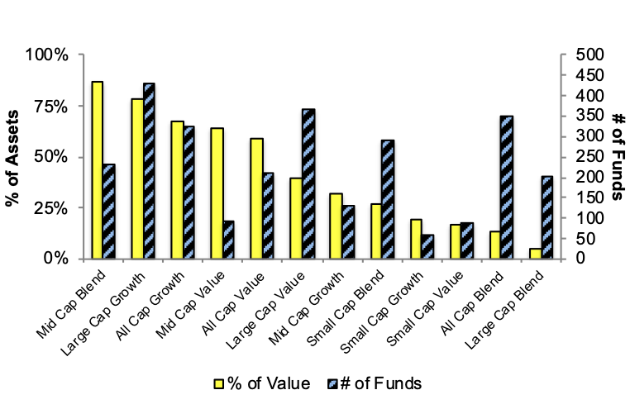 Investors in Small Cap Value have put over 80% of their assets in Unattractive-rated funds. 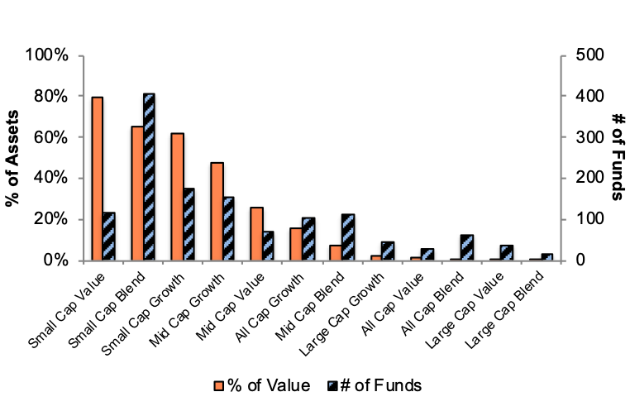 Figure 12 presents a mapping of Very Unattractive funds by investment style. 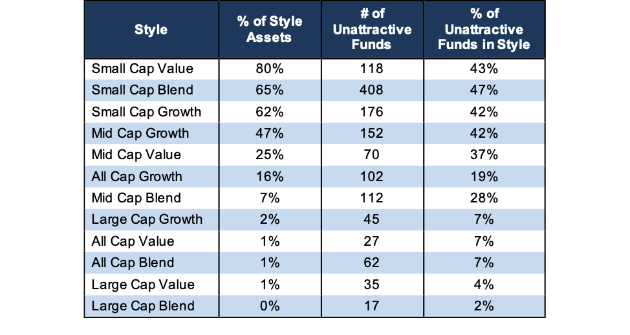 The chart shows the number of Very Unattractive funds in each style and the percentage of assets allocated to Very Unattractive-rated funds. This article originally published on January 17, 2019.